Trained as a painter in China during the Cultural Revolution, Liu was only permitted to paint government-sanctioned subjects in a hyperrealistic style. While studying art at the University of California, San Diego, she expanded her artistic language and explored other techniques, mediums, and subjects. Today, she simultaneously embraces and overthrows elements of realism. While her detailed figures are rendered realistically, drip marks and additional symbolic imagery destabilize her images and create a mystical atmosphere. Liu achieves her drip marks in a variety of ways. In her paintings, she heavily dilutes her pigments with linseed oil and allows the mixture to flow freely down the canvas as she paints. To translate this effect into her etchings, she drips acid directly onto the copper plate. Her painting and etching processes include a degree of spontaneity. When dripping paint onto a canvas or acid onto an etching plate, she can never exactly predict how the liquids will fall. She relinquishes control and allows gravity and her materials to take over, a stark contrast to the technical precision of realism. While creating her tapestries and woodblock prints, Liu has more control over the final outcome. She collaborates with a team of weavers to create large tapestries that at a distance look like paintings. 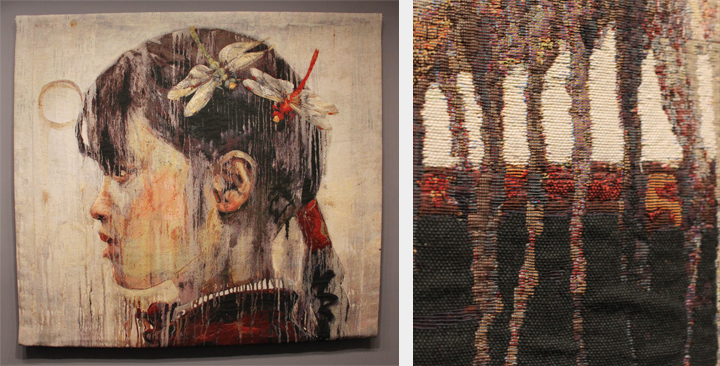 Her team weaves together numerous multicolored threads to imitate the drips of her paintings and etchings. To create a similar effect for a woodblock print, Liu carves jagged lines into the woodblock prior to coating it with ink. While these processes are calculated, the intentional drip marks give the illusion of impulse. 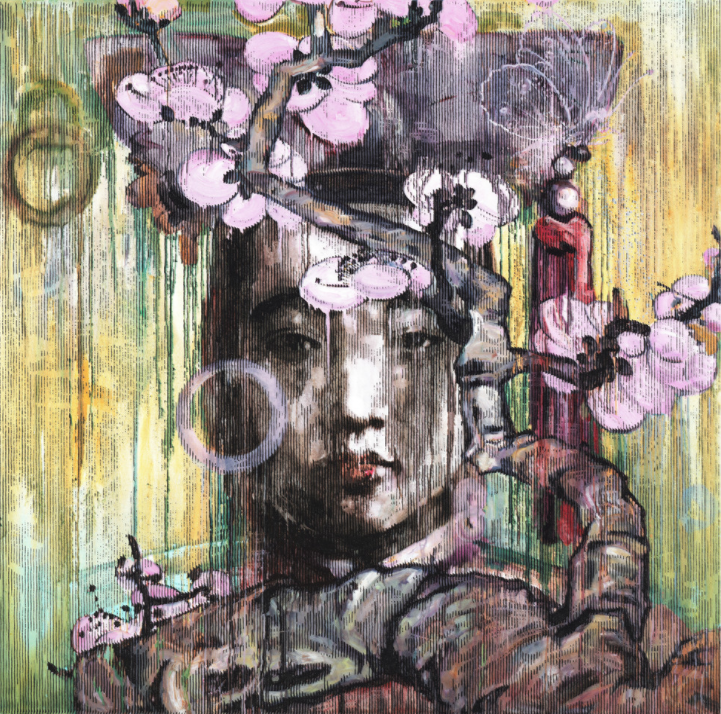 To learn more visit the artist’s website, watch a video of Liu working in her studio, and visit the museum to see the special exhibition Hung Liu In Print. Reserve your spot to meet the artist at NMWA on June 6, 2018. —Kali Steinberg is the spring 2018 publications intern at the National Museum of Women in the Arts. This entry was posted in Artist Spotlight, From the Collection, NMWA Exhibitions and tagged Hung Liu, Hung Liu In Print by Women in the Arts. Bookmark the permalink.